Wyatt & Butterfield, LLC in Anchorage, Alaska, serves clients throughout the region in cases involving complex family law issues. Our attorney and staff combine experience, tenacious advocacy and dedication to achieve the best possible results. While we are prepared to take any case through trial, we also work toward agreeable settlements in the best interests of our clients and their families. Our primary attorney, Mitchell K. Wyatt, dedicates his practice to family law and works strategically to protect his clients and maintain a solid record of results. Our law firm is prepared to handle even the most complex disputes in divorce, interstate child custody issues, spousal support and fathers' rights issues. At every stage, you can trust that we will provide an honest evaluation of the challenges you face and help you make the best decisions when proceeding, either through settlements or litigation. Our family law firm understands the personal, financial and emotional consequences of family legal issues. We will remain compassionate, treating your case with the dignity and respect it deserves. If you are interested in learning more about our services, our firm provides personal and confidential consultations so that you can have a clear understanding of your rights, obligations and potential pitfalls before proceeding. You can trust that we have the experience, strategy and foresight to effectively resolve family disputes in the best interests of you and your family. 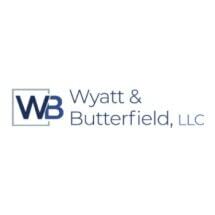 Wyatt & Butterfield, LLC offers personal and confidential consultations and will take the time to provide you with an assessment of your options. We offer flexible appointment schedules to meet your needs. Monday - Friday, 10 a.m. to 6 p.m.